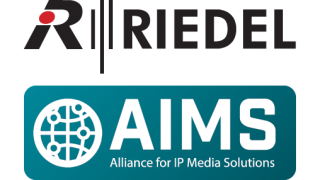 Riedel Communications has joined the Alliance for IP Media Solutions (AIMS). Founded in 1987 and headquartered in Wuppertal, Germany, Riedel Communications is a provider of real-time networks for audio video and communications applications; in particular, digital audio matrix systems and fiber-based real-time media network technology. Its products and technologies, including MediorNet, a fiber-based video network for integrated signal transport, are in common use throughout the world in broadcast, pro-audio, events, sports, theatre, and security applications. These include applications in the staging of major global sporting events and within international sports governing bodies. “At Riedel, we have always been dedicated to facilitating reliable and versatile workflows that meet our customers' individual requirements,” said Lars Hoehmann, product manager, MediorNet. “By joining the Alliance for IP Media Solutions, we extend our product’s format support, providing our customers with more benefits of standards-based communications solutions while offering them plug-and-play simplicity. Our aim, as a solutions provider, is to secure their investments and to support them on their path toward IP-based media infrastructures." AIMS’ efforts are focused on promoting the adoption, standardization, development, and refinement of open protocols for media over IP, with an initial emphasis on VSF TR-03 and TR-04, SMPTE 2022-6, and AES67. Broadcasters and other media companies are seeking to leverage IP to increase the flexibility of their networks, help streamline workflows, and improve agility to better compete in a rapidly evolving ecosystem. Open standards are the key to protecting current investments and ensuring long-term interoperability. AIMS provides specific guidance in its bylaws to its members and to the media industry via the AIMS Roadmap. The organization endorses an IP transition plan that includes support for SMPTE 2022-6, AES67, and VSF recommendations TR-03 and TR-04.